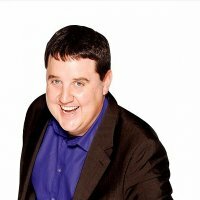 If you haven't heard of multi award-winning, chart-topping, ratings-busting, side-splitting comedian Peter Kay, where have you been? His last UK tour, The Tour That Doesn't Tour Tour That Became The Biggest-Selling Tour When It Toured Tour (I think I've got that right), outsold all who toured before him (and since - he made the Guinness Book of Records with that one) and he's traversed the Official Singles Chart more than once to reach the summit with three hits. If you haven't hummed 'Is This The Way To Amarillo' at least once, you are officially deceased, or totally oblivious to one of the country's most endearing entertainers. As Brian Potter, the wheelchair-bound club-owner and curmudgeon in Phoenix Nights, he's had us weeping with joy at his calamitous shenanigans. In spin-off Max and Paddy's Road to Nowhere, Kay and co-star Patrick McGuinness sent up security guards, not with any malice, but with beautifully observed nuance. And glammed up as talent-show winner Geraldine McQueen, you began to feel just a bit sorry for the likes of Michelle McManus and Susan Boyle. Apart from the occasional chat-show appearance (and memorably wrecking Jonathan Ross' studio set), Peter Kay doesn't really reveal much about himself - until now, perhaps. On Saturday 20th October 2012, you will be able to witness the affable Boltonian in conversation with broadcaster Danny Baker at Blackpool's Opera House. Don't expect it to remain serious for too long because conversation will invariably go off topic once Kay gets going. The show will be filmed for future transmission and you could be there for the princely sum of £35/£45. We will have tickets on sale from 10am on Friday 28th September - Kay's only live appearance in 2012 is expected to sell out in minutes.